What is a Water Watch? A Water Watch activity can help a group choose the best sources of safe drinking water. It can also help find sources of contamination now, or possible problems in the future. A Water Watch activity can be a long process that involves the whole community and includes many of the steps in planning a water project, or it can be a shorter process done by a small group responsible for community water safety and supply. The most important thing is to listen closely to the whole community, especially those who collect and treat water every day. Is there a person or group in the community responsible for wells, pipes, or other water supply systems? Is there a person or group responsible for sanitation? Which people or groups most often collect, carry, treat, and store the water? These people or groups should be involved in the Water Watch and in any improvements to water sources. Together with the people responsible for the water, list all the water sources in the area. Note what people say about drinking water quality and quantity. Note the work it takes to collect water and ensure that it is safe, and how much time people spend doing this work. How much water is used every day? Are different sources used for drinking, cooking, bathing, watering livestock, farming, and other needs? Is there enough water for all these needs? 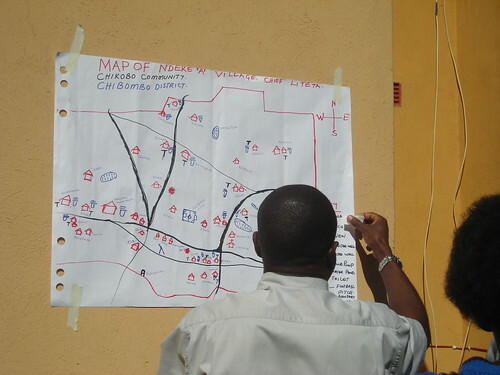 A map of the community can show where the water sources are in relation to people’s homes and to sources of contamination. A map should also show important landmarks such as roads, paths, houses and other buildings, farms, fields, toilets and sewer lines, and dumping sites. Different kinds of water sources can have different problems and different solutions. Visit springs, wells, surface waters (rivers, streams, lakes, and ponds), and rainwater catchment sites. At each water source, start a discussion about how this water is used and if anyone suspects that it is contaminated. Is it hard to get to the water source? How long does it take to bring water home from the source? Does the source provide enough water all year round? Is the source unprotected, such as an open well, ditch, or pond? Do people wade, wash clothes, or bathe near where water is collected? Are pit toilets or sewage close to the water source? Is there garbage in, or very close to, the water source? Are there snails in the water or living in the bank? Is there slimy green plant life (algae) growing on the surface? Is the water cloudy or dirty? Is the water a strange color, such as red or black? Are there problems cooking with the water? Are there problems washing with the water? After the visits, make changes to your map to reflect what was learned. Safe water sources and contaminated sources may be marked in different colors, new sources of contamination can be added, and so on. You may need to make a new map that can be used to assess changes in water sources in the future. A Water Watch can lead to different kinds of action depending on what problems are found and what the community decides to do. Who should be involved in planning for water? Everybody. Men, women and children. Women may have different needs for water than men. It is usually women who collect and treat water for family use, but it is often men who are in charge of building and maintaining water systems. How can we use the Water Watch results to plan improvements to our water supply? After doing a Water Watch or using other methods to understand your community water security problems, you can begin to plan improvements. When making a plan to improve the water supply, start with local resources including: local water sources, people with the skills to build improved wells or water storage tanks or install pipes, or older people who remember how water was collected many years ago. It is best to improve existing water sources before trying to develop new ones. The actions your community takes to improve water security depend on which problems are most urgent, or easiest to solve first.What is important is to make a plan that addresses the root causes of the problems and satisfies the needs of everyone in the community. If water is scarce or difficult to get to, building rainwater catchment tanks, storage tanks or a piped water system may help bring water closer to the community.If this is not possible, can the work of collecting water be shared to make it fairer and easier for everyone? If there already is a water system, can the community improve it by improving collection methods, fixing broken pipes and pumps, protecting water sources and conserving water? If it is a problem that should be resolved by the government, can the community solicit government support? If the water is contaminated by germs, the source can be improved or the water can be treated to make it safe. The community can discuss which of these options will be easiest, most effective, and most sustainable over time. quality test can be done. If a test shows that the water is contaminated, more contamination should be prevented and another water source should be developed. What are the barriers to planning a water project? There may be many reasons why a community lacks safe water. Problems might include lack of money, lack of knowledge about building water systems, lack of support from the government, or lack of participation by people in the community. To achieve the goal of safe water, the barriers must be identified and removed one by one. immediate community benefits such as more water, easier access, or less disease. only small changes in daily routine. positive results such as less mud, fewer mosquitoes, or more water for home gardens. Governments have a responsibility to protect water sources for the common use of all people. Like other rights, the right to water only exists if people use it and defend it. As water grows scarce and becomes a source of ongoing conflict around the world, communities, governments, and international agencies need to work hard to defend the right to water for today and for the future.